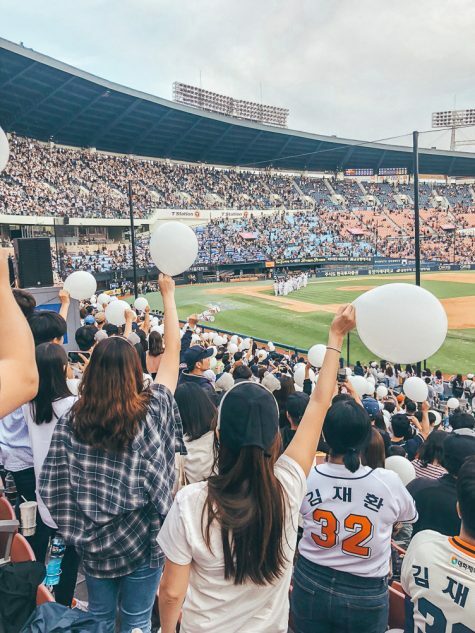 Korean Pop (K-Pop) music is a phenomenon that is slowly gaining popularity worldwide, thanks to hit songs like Psy’s “Gangnam Style” and more current bands like BTS. K-Pop is a genre of music entirely unique to Korea, characterized by upbeat and positive songs with heavily choreographed visuals. Korean pop bands consist of young attractive stars who spend many (often greuling) years in training to find stardom, learning to sing and dance in choreographed perfection. The groups are heavily influenced, its members artificially put together based on their potential for success. If successful, these band members become some of the biggest celebrities in Korea endorsing various products in advertisements and playing roles in Korean TV dramas. 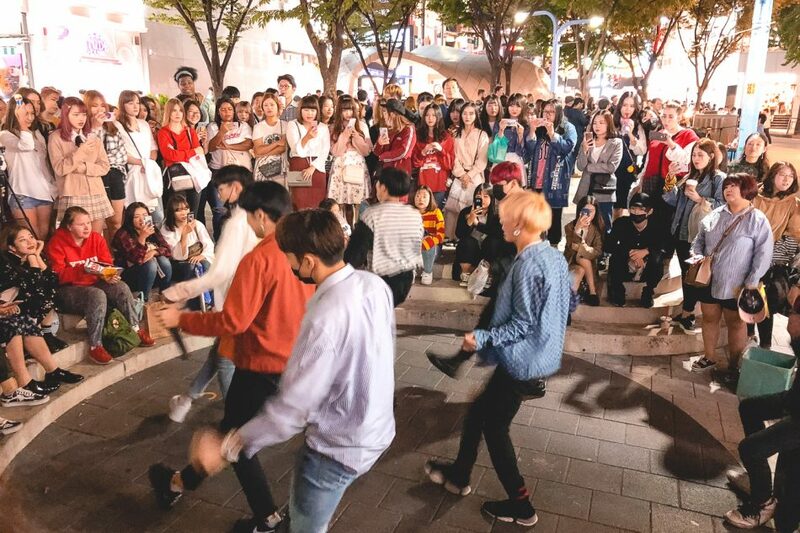 While we weren’t able to watch a formal concert while in Seoul, areas like Hongdae and Gangnam are full of young groups performing on the streets to crowds of fans catching every minute on their phones. With so many various groups and styles, it was hard not to be hypnotized by their catchy songs and dance moves! 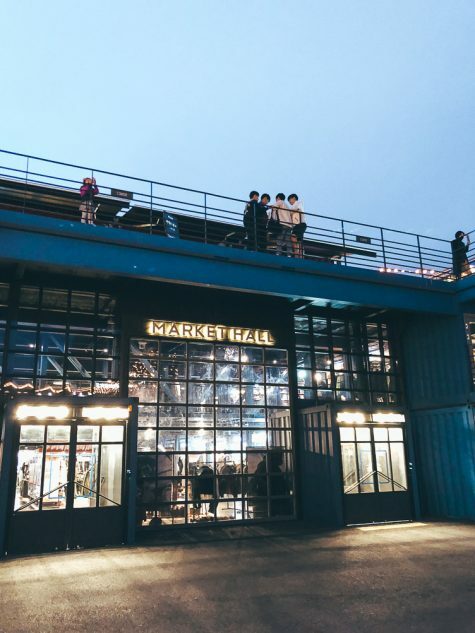 While somehow simultaneously modern and traditional, Seoul also has a wacky and bizarre side. 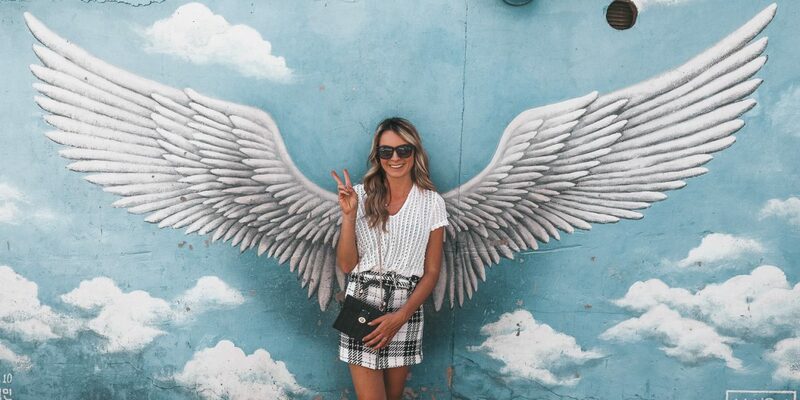 The city is known for its originality and creativity, which makes it even more fun to explore. 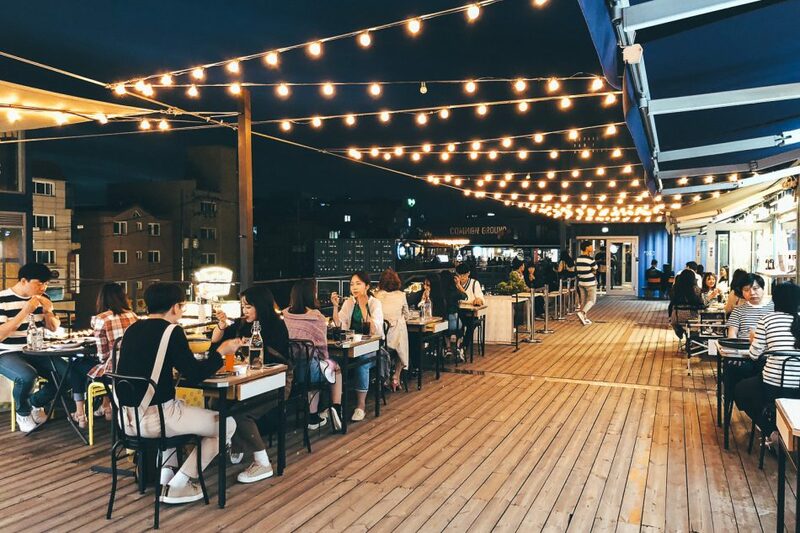 In Seoul you can find cafes in every flavour, including animal cafes (where you can enjoy your coffee with a meerkat or racoon), a toilet themed cafe, and even a cafe containing a large ball pit where you can sip your cocktail while atop a pool floatie. 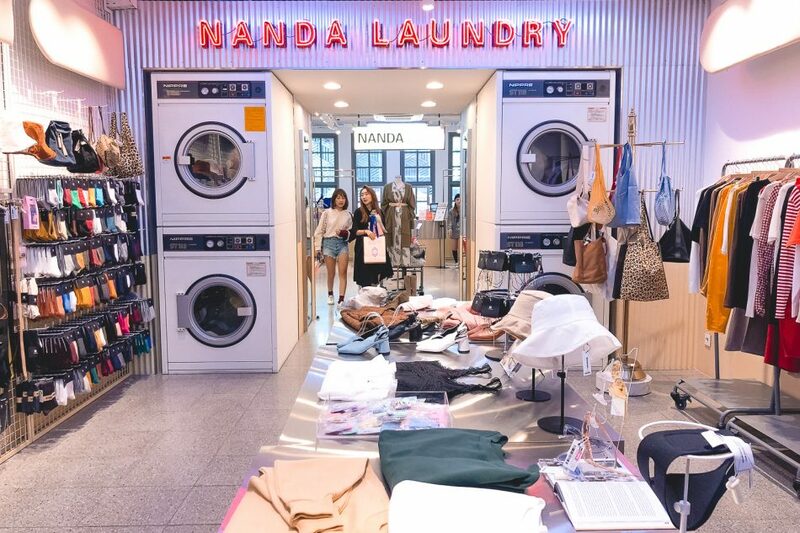 The city is full of innovation, with department stores like the one below designed with every floor as a level of a hotel, or ones that make you feel like you’ve stepped into an airport. 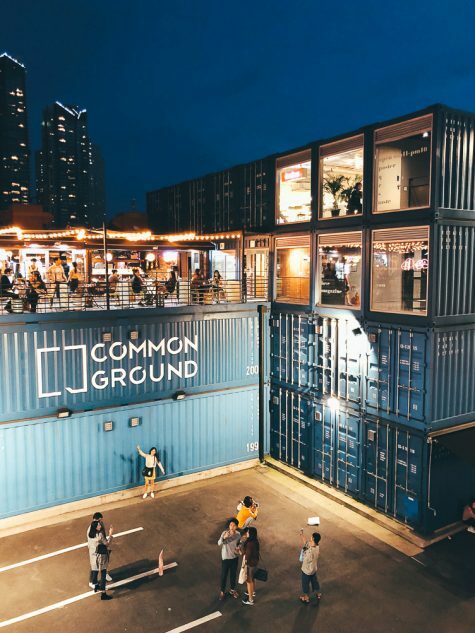 One of our favorite innovative spaces was Common Ground, a pop-up shop made of over 200 shipping containers. 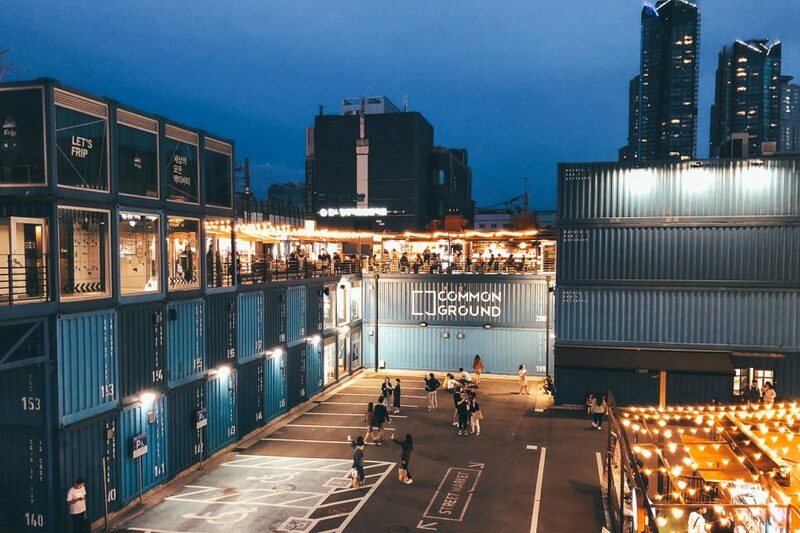 The containers are full of trendy shops featuring up and coming designers, as well as several restaurants. 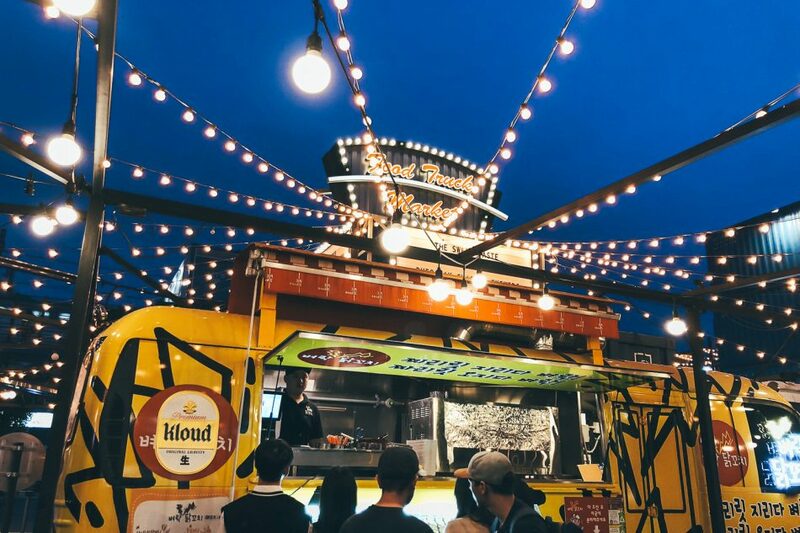 The ground level also features several food trucks, while the third floor terrace was where we spent an evening under cafe lights enjoying a traditional Korean meal. 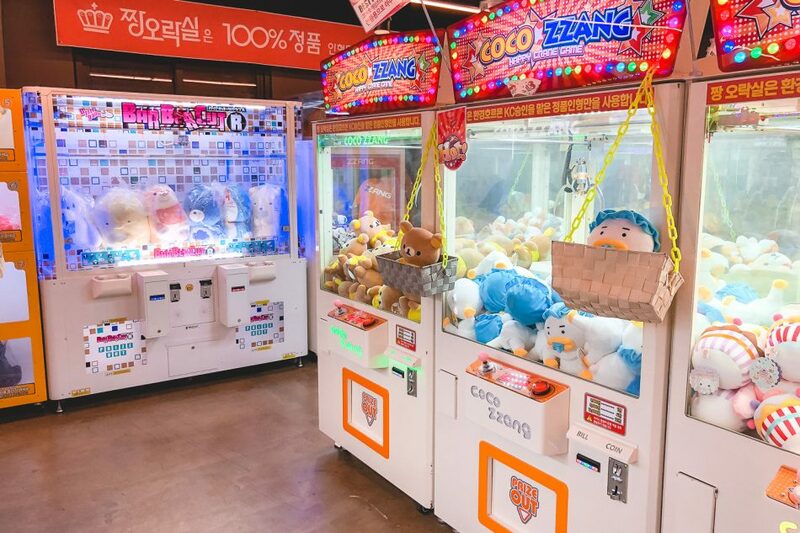 Technology is a cornerstone of Korean culture and as one of the most wired countries in the world, gaming is a part of everyday life. 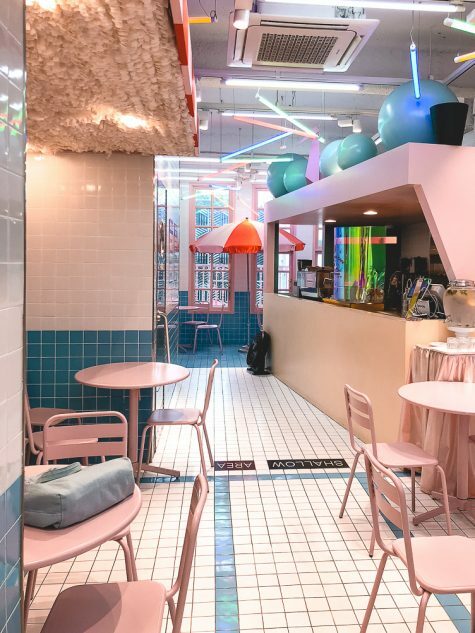 On many streets you can find a gaming cafe: a space with rows of computers and comfortable chairs where people play games online (and can have food delivered directly to them as needed). 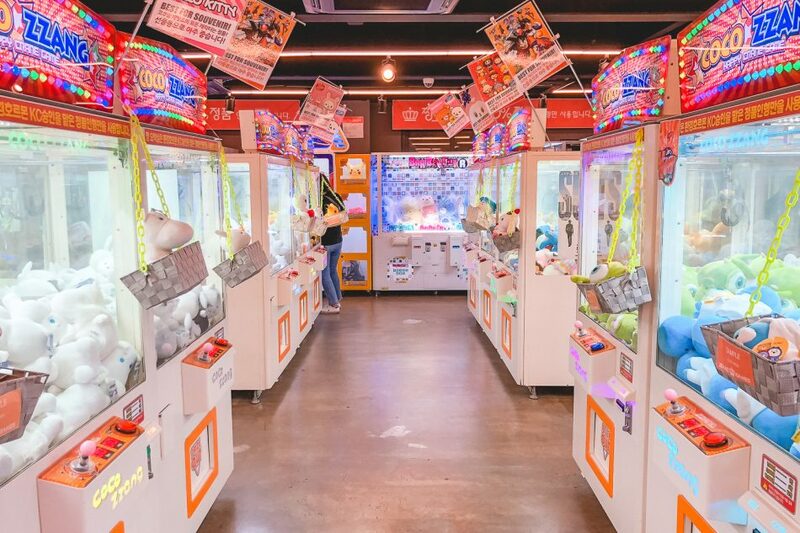 Brightly lit and flashy arcades are also in no shortage. Gaming in Korea is a beast of its own, where video game champions live like rock stars. This has created a problem among the youth, where teenagers have developed a gaming addiction. The problem is so rampant that the government imposed a curfew limiting those under 17 years of age from playing video games between 12:00 to 6:00 AM. There is even an Internet Addiction Test used to screen young adults for high risk behavior. The time spent on mastering games can be easily seen wandering into these gaming cafes or arcades. 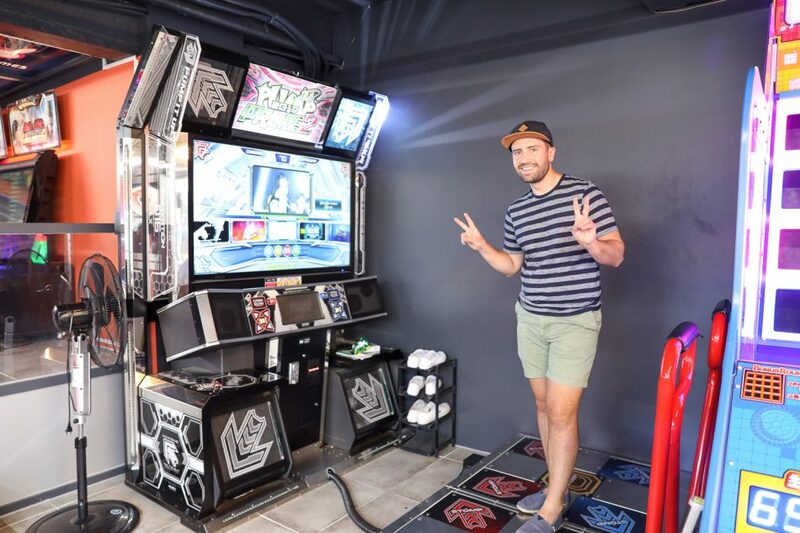 Though not related to online game play, just watching kids play arcade games like Dance Dance Revolution had us in shock. We were mesmorized watching their feet move so quickly across the DDR board, with the instructions on the screen moving faster than my eyes were even able to follow. 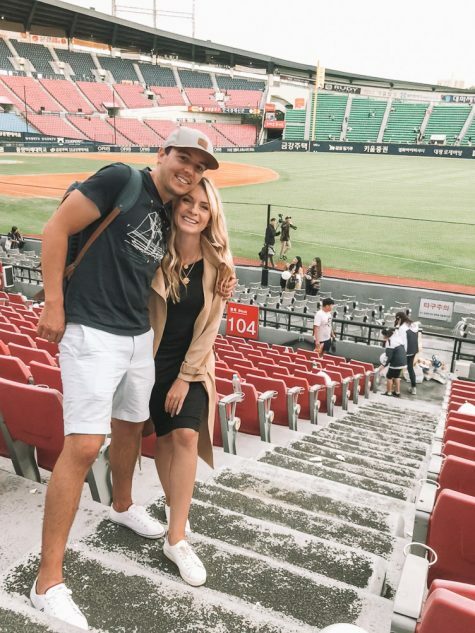 Watching a baseball game in Seoul was like no sport we’ve ever seen before. Whether you are a baseball fan or not, you cannot miss watching a game. The fans are passionate and it’s hard not to get caught up in the excitement of 10 000’s of fans cheering and singing. Plus, given that tickets range from $7-70, the price is well worth the entertainment value! 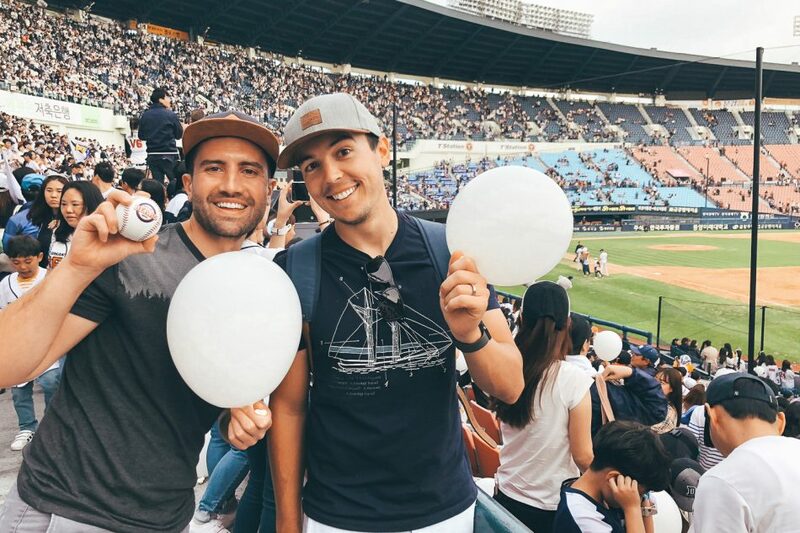 We watched one of Seoul’s favored teams, the Doosan Bears, at Jamsil Stadium. 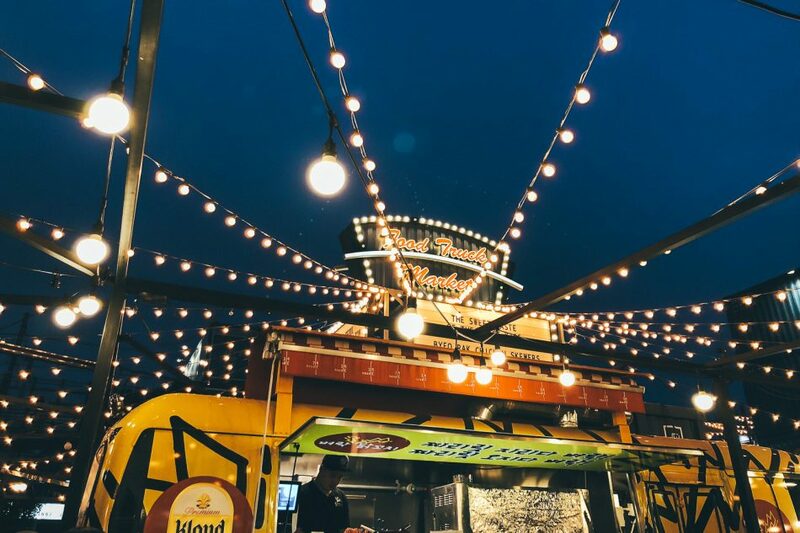 The stadium has a number of food stalls, offering everything from fried chicken to skewered meats to waffles, pizza and more. 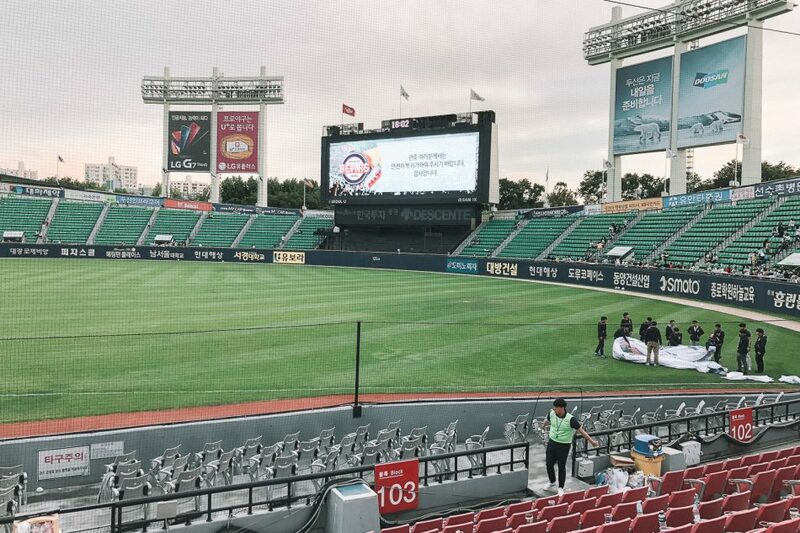 There are even convenience stores right in the stadium, as well as a KFC. The highlight was the cheer master and his cheerleaders, who would lead the crowd together through various chants and dances. Everyone seemed to know every song, and the entire crowd would stand, dance and sing together throughout the entire game. Their stamina was impressive! 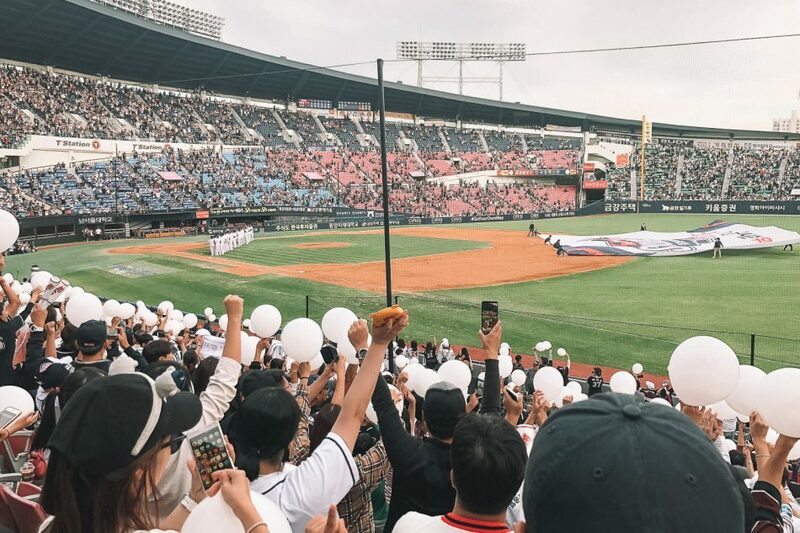 Near the end of the game, the Doosan Bears fans were each given a white balloon which filled the stands in a sea of white. 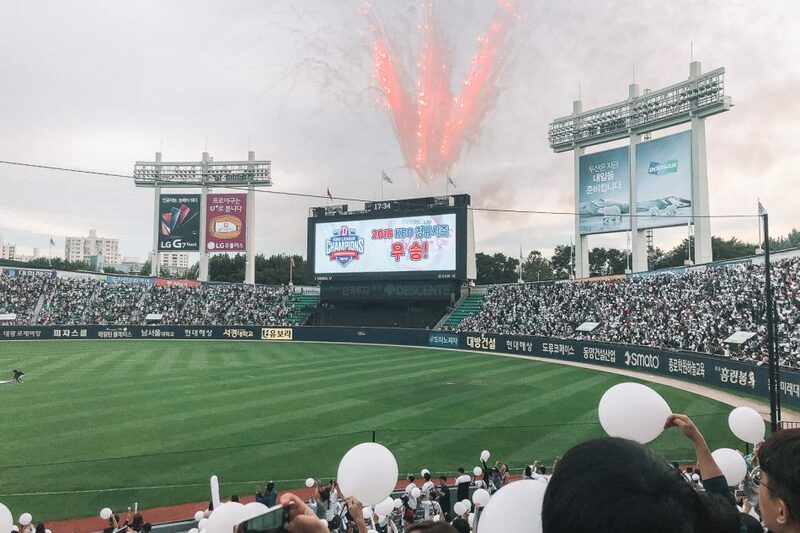 When the Doosan Bears won the game, fireworks shot off from the stadium, a large flag filled the field, and a ceremonial video was played. Long after the players were off the field, the crowd continued singing and dancing as the sun went down. Despite the game being long over, we spent almost another entire hour at the stadium just taking in every last moment of entertainment! THANKS FOR THE ENTERTAINING AND EDUCATIONAL EXPERIENCES THAT YOU HAD AND WERE SO WILLING TO SHARE. I ENJOYED FOLLOWING YOUR INTERESTING JOURNEY AND TRAVELS. LOOK FORWARD TO SEEING YOU SOON!